Change of plans: annoyance or opportunity to redraw? 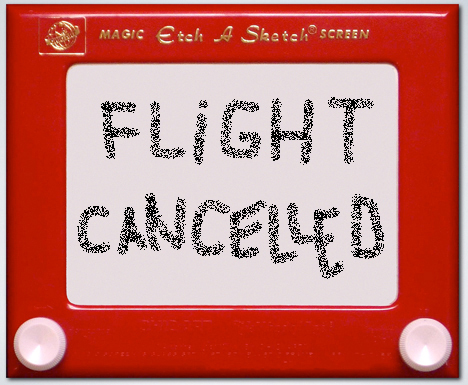 I thought of this oft-quoted phrase when, on a Thursday at the end of May, the final Delta flight on my route from Denver to Montreal was cancelled. That it was aborted after we had boarded the aircraft, taxied onto the runway and then, for some odd reason, returned to the gate, made it more frustrating. With the destination no longer a possibility that day, I struggled to enjoy the journey, even though I was going nowhere. I referenced my pilgrimage on El Camino de Santiago, where graffiti messages reminded walkers that the Camino was right here, right now, not waiting for us wrapped in a bright bow in the cathedral at the end. My travels were suspended at the Minneapolis airport, which is far more comfortable than the cool, spare shelter offered by Spanish underpasses, where artist-philosophers spray painted their exhortations to be present now. A fellow traveler showed me how to use the customer service kiosk; after scanning my defunct boarding pass, it spat out vouchers, one for the Courtyard Marriott, a $6 voucher for food only, and a $10 coupon to spend anywhere at the airport. After confirming my roundabout flight via Atlanta for the following day, which would have me arriving to Montreal 24 hours later than originally desired, the kiosk generated my new boarding passes and another, $25 voucher. Meanwhile, I practically drained my cellphone battery rearranging my visit. My new arrival time, late Friday afternoon, meant that after going through customs, collecting my bag and getting my rental car, I might not get to an elderly relative’s home before Shabbat started. Since she’s a strict observer, I didn’t want to cut it close. An accommodating friend offered to host me the first few nights. My shoulders relaxed in gratitude for her flexibility; originally, I was supposed to visit her two days later. And I was glad I hadn’t been overly attached to my agenda. There was a time when I treated plans as carefully considered works of art, and saw deviations as failures, measuring a trip’s “success” as to whether it went according to my wishes or lived up to my expectations…or not. But, as I keep learning, it’s more freeing to make plans lightly, as with an Etch-a-Sketch, easily erased and redrawn to fit new circumstances. By then, my belly was growling. I contemplated my not-so-princely sum of $41 and decided to try to savor spending it. It’s quite difficult to find a healthy meal at an airport for $6, so I dipped into my $25 coupon to cover some sushi. And while I could have easily eaten my way through the vouchers, I decided to find a souvenir of this adventure, something to remind me to have fun when life rips up our plans. At a boutique I spotted a leather change purse in cheery colors. The price was right: it would consume what remained of the $25. A free shuttle deposited me at the hotel, my albergue for the night. The staff — a gal and a guy — offered a hearty welcome and a free cookie. I grimaced, and took a chocolate chip cookie. “So you weren’t looking forward to seeing us,” quipped the woman. We laughed. I handed over my voucher in exchange for a room key. On the Camino, I might have received a bed assignment, or instructions to pick a bunk in a particular room, sleeping with up to dozens of others. This time, I had my own room with a king size bed. As a Pilgrim, I was overjoyed and relieved on the rare occasions I had a room or even an entire albergue to myself, even with saggy mattresses or rickety showers. That this one also had a gleaming private toilet, sink and shower, coffee maker, shampoo, conditioner, moisturizer, desk, and WiFi…well, wouldn’t that just put me over the moon? That level of ecstasy eluded me but, after washing my undergarments in the sink and hanging them above the radiator to dry, I started to giggle. For most of the six weeks I walked the Camino, I fell asleep surrounded by clothing draped over bunk beds. Suddenly, I felt at home. The next morning, I put on the same clothes I had worn the day before and slung my travel backpack over my shoulders. At the airport, after taking my shoes off, and putting them on, again, I tried to stretch the remaining $10 voucher. It covered a yogurt, two hard boiled eggs, a banana, and a container of pasta salad, just enough for the day. With my bag of provisions in hand, I resumed my Camino, this time on moving walkways. Great post! Always good to remember to stay flexible. I relate directly to this experience, as our final leg to Bilbao last fall was scuttled by a 12 hr. flight attendant strike in Frankfurt! It was a huge disappointment, and day of confusion, but after we embraced the adventure, it was a great story, and dispelled my fear that I’d planned our trip too tightly! Yes, it’s remarkably confusing to have one’s plans upended in a city that one wasn’t planning to visit. Glad you were able to embrace your adventure!